The following procedures must be performed in sequence to open the top cover. The bolt could spring forward suddenly and fire a round causing severe injury. Be prepared to catch ejected round. a. Emergency Action and the Bolt Can be Pulled to the Rear. The following emergency actions must be taken if the weapon initially jams but the bolt can then be pulled to the rear. (2) Press charger handle locks and rotate charger handles down. (3) Pull charger handles to the rear as far as possible without stopping or pausing, until bolt locks. Ensure bolt will stay to the rear before releasing charger handles. (4) Maintain rearward pressure on charging handles while assistant lifts top cover. (5) Insert cleaning rod section through slot in side of receiver. Prepare to the catch ejected, live round. (6) Raise cleaning rod to force live round down. Catch live round as it is ejected. (7) Remove ammo belt from feeder. 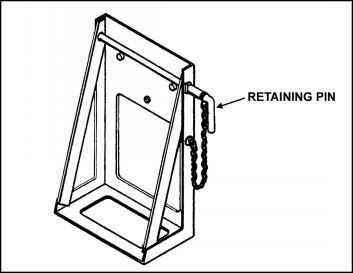 (8) Reposition ammo belt in feeder. (10) Ride the bolt forward by grasping one charging handle and depressing the trigger. (11) Ensure feed slide assembly is to the left. (12) Ensure secondary drive lever is engaged with the feed slide pin. If not, engage forked end with feed slide pin. (13) Close top cover gently. (14) Charge weapon and attempt to fire. (15) If bolt still jams, repeat first seven steps. Put weapon on S (SAFE), and evacuate to support maintenance. (1) Clear the jam and make sure there is no bore obstruction. (2) Charge the MK 19 in the normal manner, and check to see if the primary pawls have clicked up behind the cartridge in front of bolt face and the secondary pawls have clicked up behind the next round before firing. The feed pawls should click up within 1-inch of the charging handle travel. • Turn MK 19 into unit level maintenance. • Record ammo lot number, type of ammo, number of rounds fired, serial number of the MK 19 and indicate whether ammo is linked with one-piece or two-piece links. (4) If the MK 19 does not require feed slide adjustment and there appears to be no other deficiencies that would prevent the weapon from firing, it should be turned into the armorer or support maintenance.